Rated PG-13 for sequences of sci - fi action and destruction, and for some language. The aliens are back, and they want … more of the same thing they wanted before, maybe? Not that it matters, really. 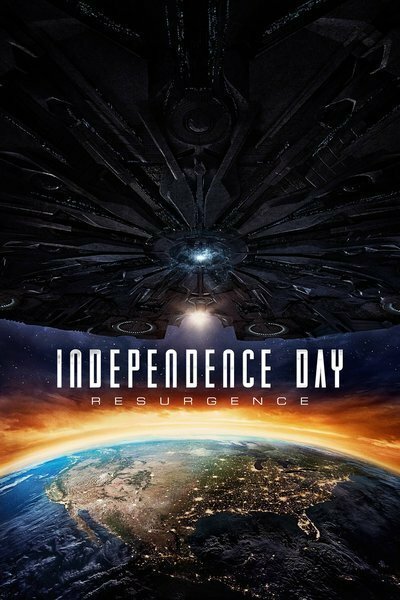 “Independence Day: Resurgence,” the sequel you probably didn’t want or need to the 1996 smash-hit blockbuster “Independence Day,” is all about the spectacle. And yes, all massive summer disaster pictures are like that—especially when they come from director Roland Emmerich, returning from the original “Independence Day.” Shock and awe are his bread and butter. But “Resurgence”—which, surprisingly, isn’t the title of a fourth “Divergent” movie—feels even more shiny and empty than most of these kinds of films. It’s not completely terrible, even though 20th Century Fox’s decision not to screen it for critics before opening day would suggest as much. It’s just dull and hollow—a massive waste of time and money. The characters are flimsy, the dialogue is stilted and the amount of destruction is ridiculous, even if that’s all pretty typical for the brand of blockbusters inspired by Emmerich's 1996 hit. You go see a movie like “Independence Day” for the visceral thrills, but here, they’re in woefully short supply. Because so many movies have come along in the past two decades featuring this kind of high-tech annihilation, “Resurgence” feels like a glossy copy of the sort of blockbuster we’ve watched countless times before. Entire cities get sucked up into the sky and dropped back down again. Fighter jets engage in dizzying dogfights with speedy alien aircraft. Major global landmarks get blowed up real good. There is exactly one scene toward the end, featuring a big reveal of the real enemy, that offers the sort of excitement and stakes you’re hoping to see. But man, is it a slog to get there. There’s also William Fichtner who, surprisingly, doesn’t turn out to be a secret villain for once as the commanding general; model/actress Angelababy, who basically exists to serve as eye candy and appeal to coveted Chinese moviegoers; and, in the strangest bit of casting of all, Charlotte Gainsbourg as a psychiatrist studying people who’ve come into contact with aliens. And—what are the odds?—the aliens have come back, exactly 20 years later in a flair for the dramatic, to make contact again. Only this time, they’re in a spaceship that’s 3,000 miles wide. (“How the hell did we miss this?,” Goldblum’s David Levinson wonders aloud.) They use it to latch onto Earth in order to drill into its core and steal our resources. Or something. Only a giant, talking orb—smooth, shiny, white and full of crucial intergalactic information, like the latest must-have device to roll off the Apple assembly line—can stop the obliteration of humanity. You could look at it as a satirical metaphor for the growing sense of xenophobia and isolation that plagues places throughout the globe: “These invaders are coming here illegally to take from us and wreak havoc. We have to keep them out. We have to make Earth great again.” But that would require thinking. Emmerich crosscuts between all these various characters and storylines with little sense of pacing or coherence. Just as something “important” is happening, he’ll jump over to something else, mixing suspense, seriousness and silliness in a way that’s jarring. Whereas the attempts at humor in the midst of great peril often worked in the original “Independence Day”—because it was a movie that was self-aware without teetering into parody—here, they’re consistently clunky. And because so much of the action takes place in various bunkers full of enormous monitors and anxious, uniformed people barking orders, it’s hard to tell who’s where. Washington D.C.? Area 51? The moon? They all look exactly the same. They will all look exactly the same again—at least to the aliens—when the inevitable third “Independence Day” movie comes out, as it’s suggested in the film’s final moments. This time, you’ve been warned.